Geothermal features are practically unique to Yellowstone, but the mountains, streams, alpine lakes, and wildflowers may be at least as good as the other Parks. All national parks are busy in the summer but this one is very near the top. People come to the ‘Stone for a reason, I figure because they believe they’re going to see something here they won’t anywhere else. Some come a long, long way. We heard a lot of Asian languages spoken, and surprisingly more German than BBC or Crocodile Dundee English. We saw hordes of Japanese tourists posing before signs, the best overlooks, and even on their rental autos. 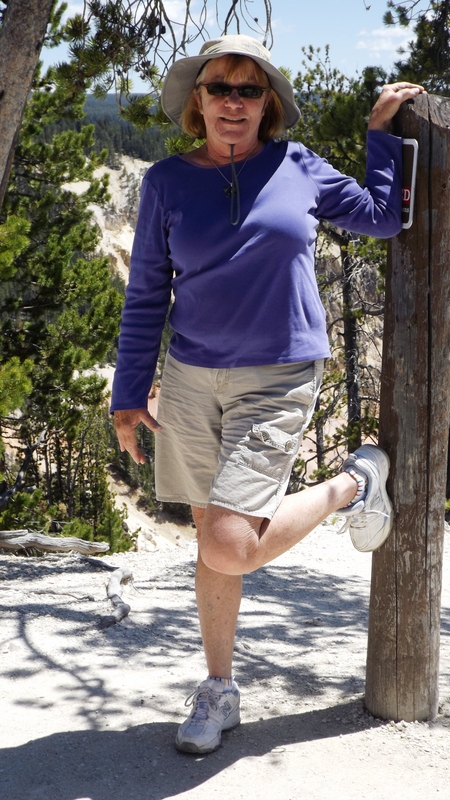 Their women tend to be a bit dramatic, often doing Betty Garble or Marilyn poses while blocking our vision of a Rick Steves view. It annoyed the Kat. Here’s her revenge. There once was a petrified redwood forest formed by one of the three mega volano eruptions that shaped the park. That forest mostly stood upright in the 1870’s. 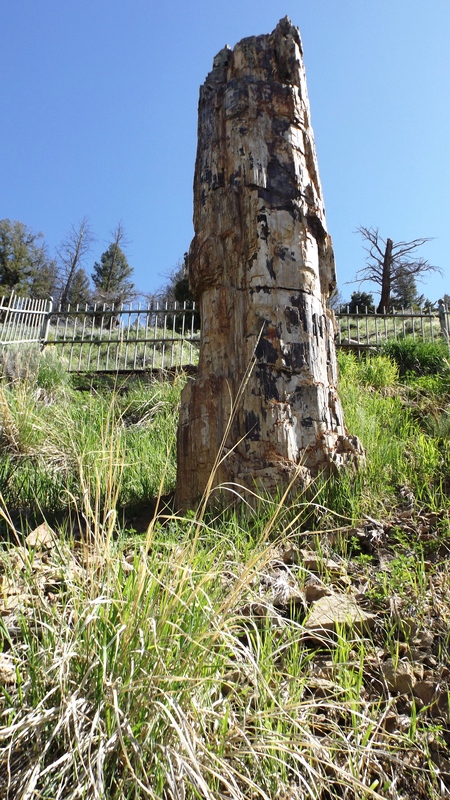 By the early 20th century tourists had chipped away and carted off all but part of one last petrified tree. The steel around it (Kat’s camera fit between the bars) lacks razor wire at the top, but is of a heavier gauge than New Orleans burglar bars. And for good reason. 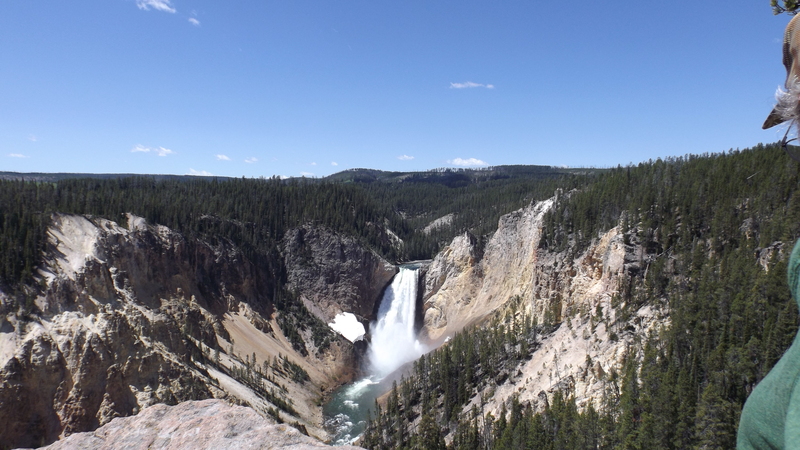 The Grand Canyon of the Yellowstone drops a serious volume of clear, green water huge vertical distances. Over the eons it has formed a canyon similar but not as long or deep as The Grand Canyon, which has no serious falls. I’ve only seen The Grand Canyon from 30,000 feet, but I really like GC of the Yellowstone. Alpine lakes dot the park, and they are insanely inviting. But you know that water’s cold! Would that we had a canoe, or could rent one. 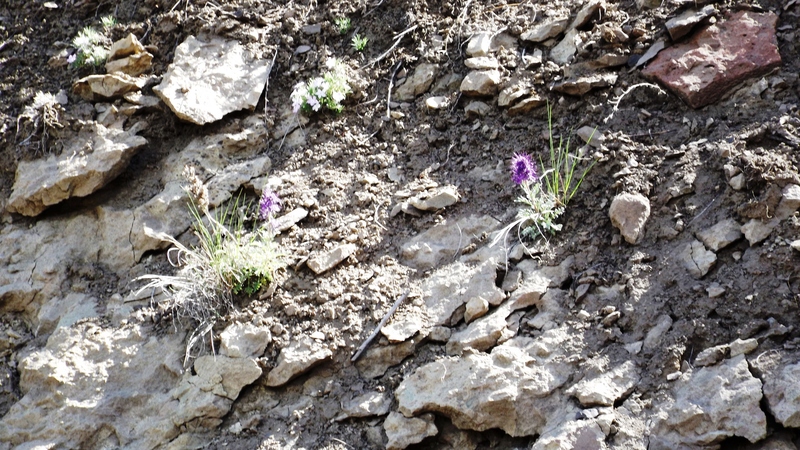 Kat and I are serious wildflower fans, and to our surprise the fleurs are already out in force. Right now I don’t know what these are called, but if I can find them on Google, this post will be updated, pronto. 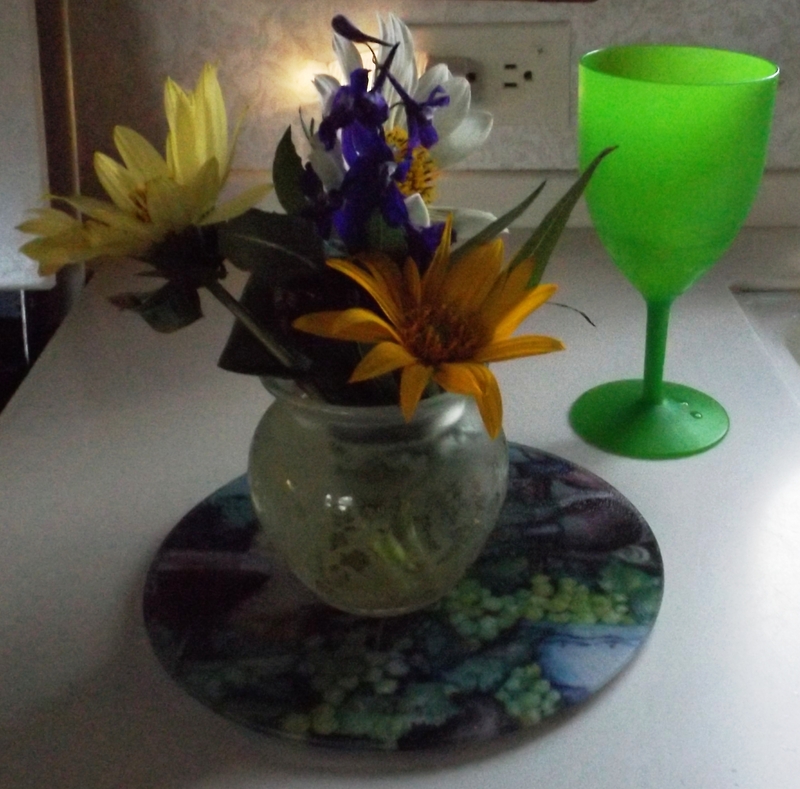 The arrangement of what looks like wild daisies and a violet was picked in Idaho, a few miles outside Yellowstone. 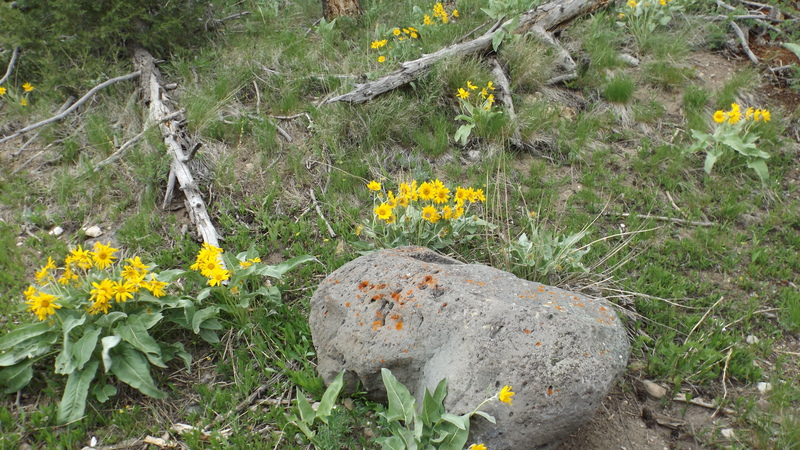 The first half of June is not too early to visit, and judging by campground availability (despite news stories on park business booming) it was not yet lethally crowded. If you haven’t been to Yellowstone, you gotta go. Love the Alpine lakes and the waterfalls! 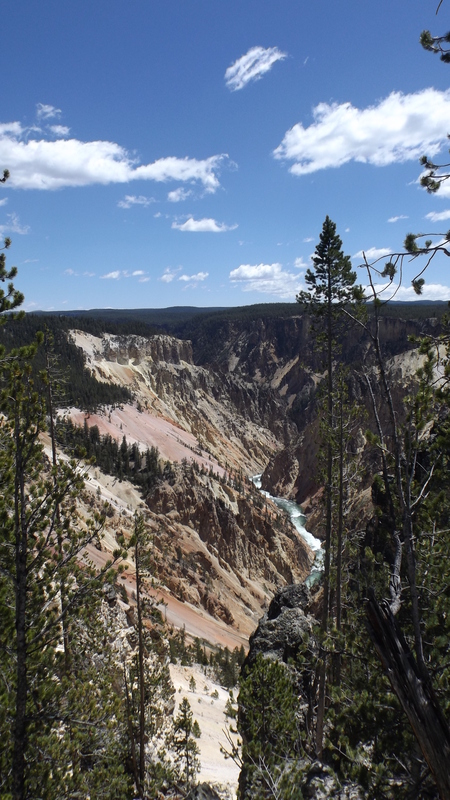 Yellowstone and Glacier are on our short list of places to visit. Yeah, I wish we had some kind of portable boat. 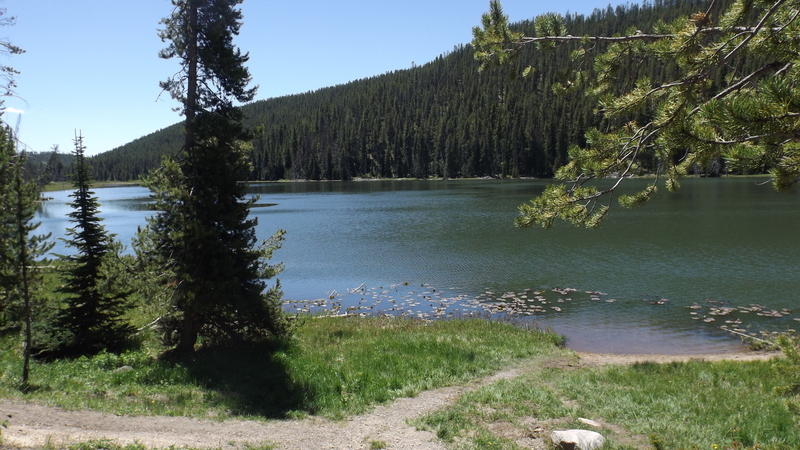 Of course I also wish I had brought a fish landing net when we camped at Newton Creek … could have limited out on cutthroats without wetting a hook!